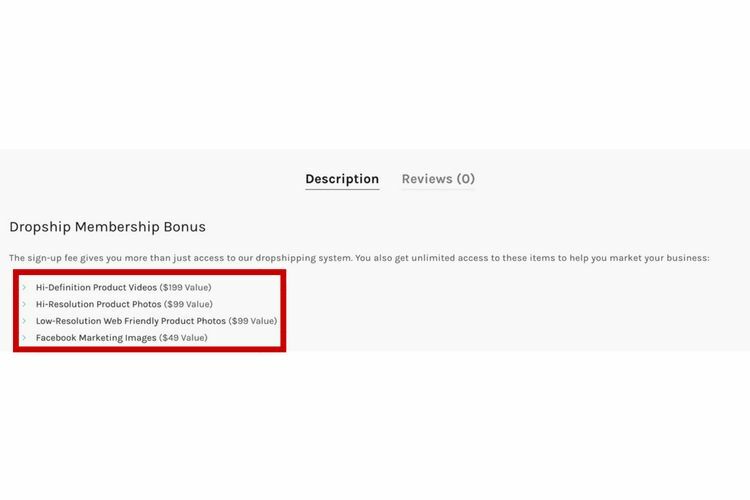 In-Depth Review of Our Dropship Bundles Memberships! Understanding how Dropship works can be one difficult task to tackle. 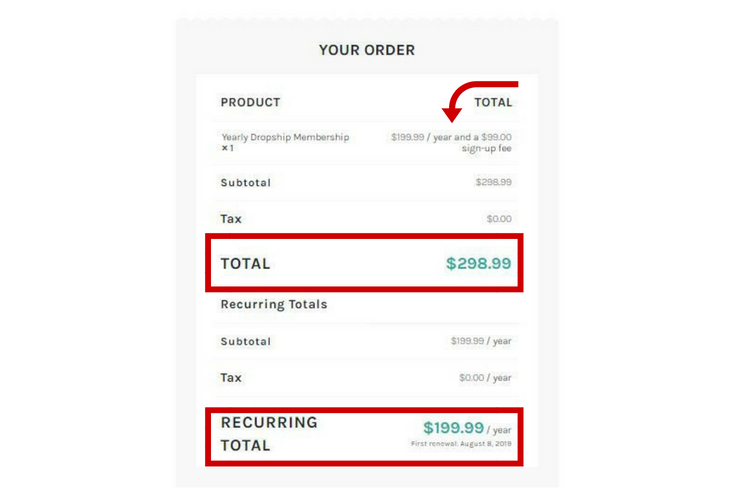 Understanding how our Dropship Bundles memberships work can be an even more difficult task. What’s the difference between the memberships that we offer? We do admit that the difference between the memberships we offer can sometimes be difficult to comprehend. 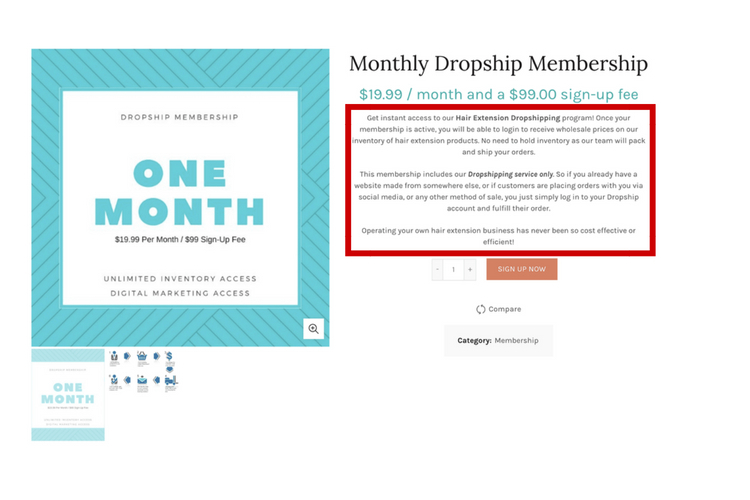 Which is precisely why we wanted to address that issue by focusing this entire blog post to explaining what our Dropship memberships include. This article will clear up many of your questions about what we offer with our programs! Because at the end of the day, you are the one investing in our programs at Dropship Bundles so you should know exactly what you’re paying for. We’ll give you just that! Drop shipping is when we ship hair, eyelashes, and edge control to your customers on your behalf. No need to hold inventory as our team will pack and ship your orders. We offer three Dropship Bundles membership. A Monthly Dropship Membership, a Yearly Dropship Membership, and a Lifetime Dropship Membership. These three Dropship memberships only offer our Dropshipping services. These memberships are ideal for those who may already have a website made from somewhere else, or they are selling their products on a different platform, like social media, and just need to utilize our dropshipping service only. 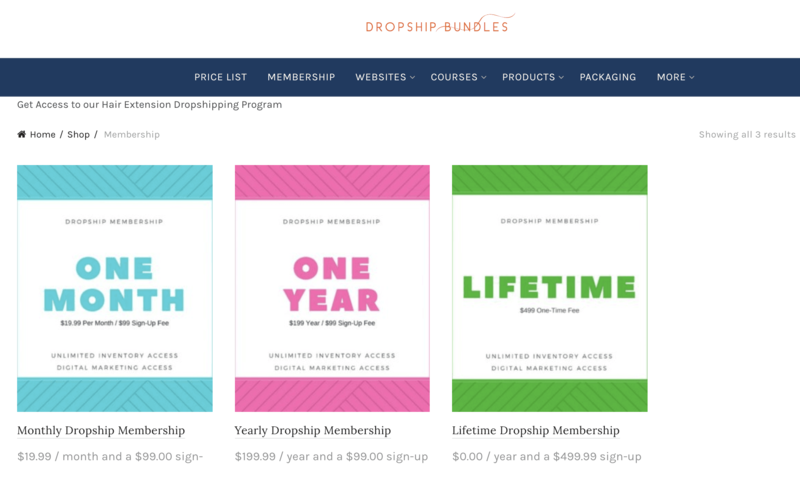 All three of our Dropship Bundles memberships are located under the “Membership” tab on our homepage menu bar. You will then be redirected to this page here, which I’m sure may look very familiar to you. On the bottom of each Dropship Bundles membership, you will see the signup fee for each one. The only real difference between all three memberships is based on your preference on how often you would like to pay for your Dropship subscription. Let’s break down the cost of each membership, shall we? Our Monthly Dropship Membership has a $99 initial sign up fee and $19.99 a month after that for you to continue using our dropship service. For our Yearly Dropship Membership, you would first have to pay both the yearly fee of $199.99 and the initial sign up fee of $99 – totaling to $298.99. Then every year after that, you would just pay the $199.99 yearly fee to continue dropshipping. Lastly, our Lifetime Dropship Membership gives you the leisure to pay only a one-time signup fee of just $499.99. Meaning you would have access to dropshipping for life! That’s pretty awesome, don’t you think? If you keep scrolling all the way down to the “Description” section of the membership page, you will see an even more detailed explanation of what comes with our memberships. All Dropshippers get exclusive access to both our high and low-resolution product photos that we offer in many different colored backgrounds, as well as our product videos and marketing material for social media. Our free online video courses at Hairuniversity are included as well! We want to make sure you guys get a bang for your buck, you know? Last but not least, we definitely haven’t forgotten about our website memberships! Our website memberships are exactly like our Dropship Bundles membership except it comes with a website. 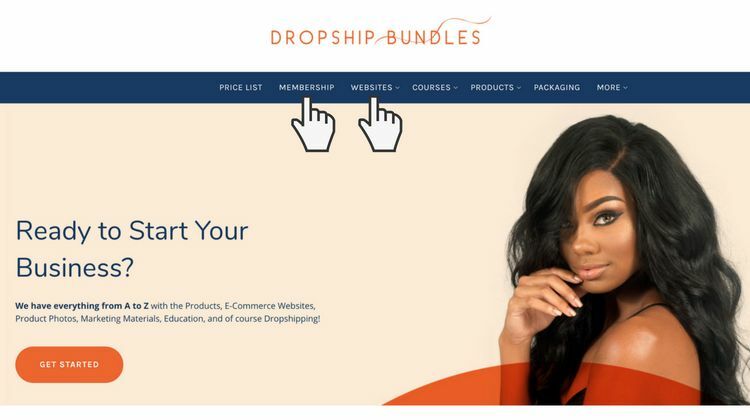 Of course, all website purchases automatically come with a Dropship Bundles membership – like a 2 in 1 package. 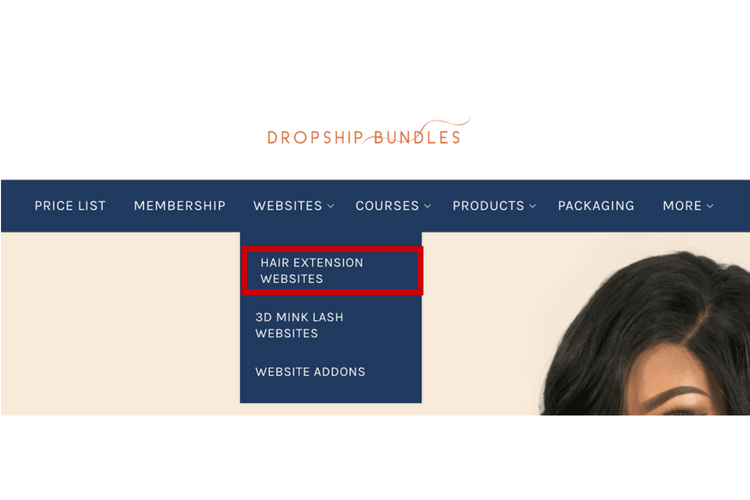 You can access our website memberships under the “Websites” tab on our menu bar on the Dropship Bundles homepage. 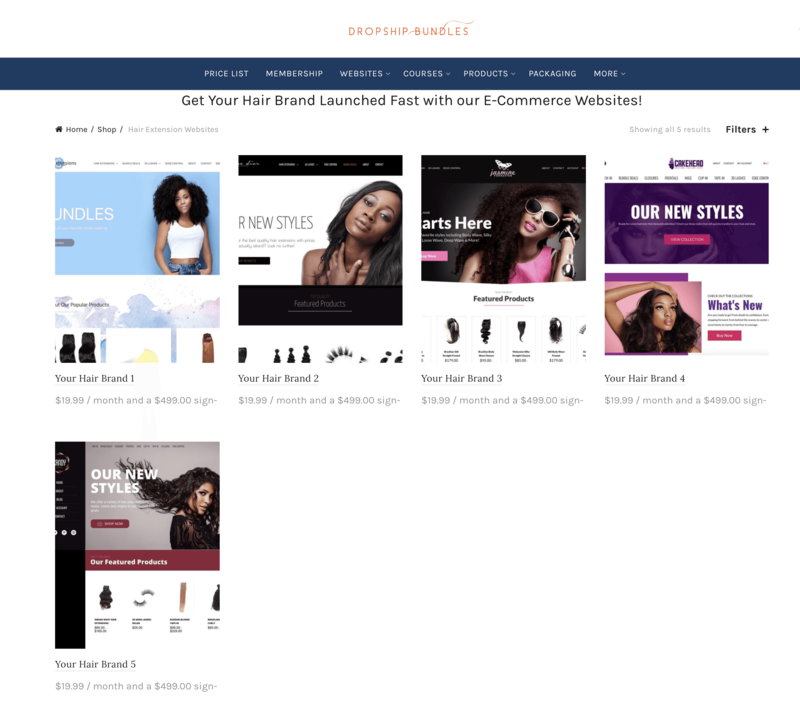 As you can see we not only hair extensions websites, but we have lash websites as well for those who may want to focus their business on selling mink eyelashes. 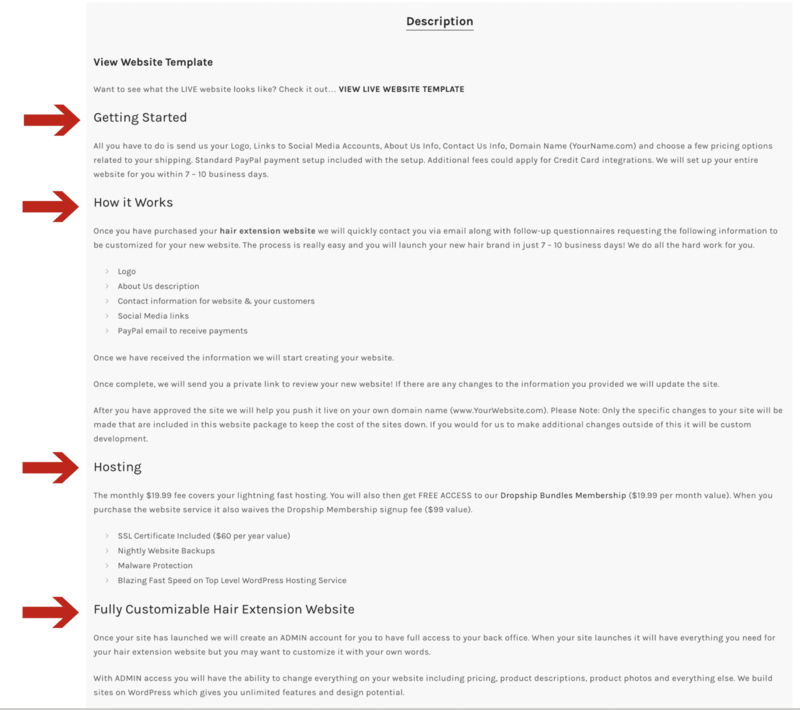 The only difference between all five website options is the design layout. We at Dropship Bundles can’t stress enough how important variety is. Options options options. We love giving you guys options! So it’s really up to you and what your preferences are when it comes to the design layouts. All of the website memberships have a $499.99 initial sign up fee and $19.99 a month after that for us to continue to host your website and dropship. All websites will be pre-loaded with all of our products including bundles, bundle deals, edge control, and mink lashes. Don’t forget to keep scrolling down to the “Description” section at the bottom of the product page where you will find more in-depth information on our website memberships. It’s very important to read everything that’s explained in the “Description” section before you make a big purchase, so you know exactly what you’re getting! This will leave you with fewer questions and definitely less confusion. Website development time takes around 7-10 business days after you have submitted your website form. Once completed, our tech department will notify you so you can push your site live! Of course, all of our product photos are accessible for Dropshippers with a website membership. Feel free to use any of our product photos and videos for your website. Their there for you guys to use for your website, social media and even for printouts. If you ever have any confusion or questions about our memberships, this helpful article will still be here waiting for you! We know all of this is a lot to take in at once, but that’s why we’re here to help ease your mind. 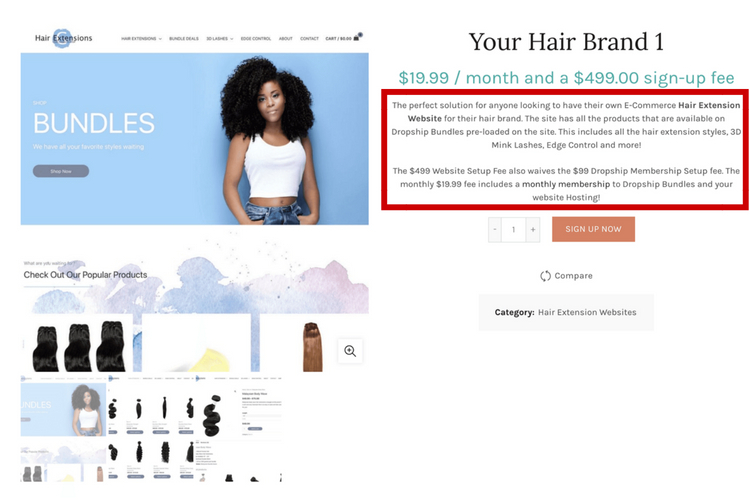 Now that you’ve gotten a clear vision of how Dropship Bundles work, we sincerely hope that this article sparked your interest in starting your hair business journey with us! Remember: You create the brand. We’ll do all the hard work for you.